The future of refrigerated container tracking is here. Customer demand for remote container management is on the rise and companies are turning to the latest technologies to keep up with the competition. While container tracking has been around a long time in various forms, today it is part of a much bigger trend towards machine-to-machine (M2M) telematics and sensors which connect and monitor the ‘things’ in the Internet of Things (IoT). Over the next five years, billions of everyday objects, including containers, will transition from ‘dark, dumb and disconnected’ to ‘visible, smart and connected’ thanks to M2M and IoT technology. 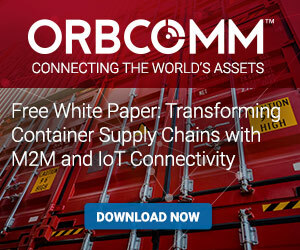 For a more in depth look at connected container trends, technology and benefits, be sure to download our latest White Paper entitled Transforming Container Supply Chains with M2M and IoT Connectivity. This new white paper offers a current snapshot and future outlook on M2M and IoT in the global container supply chain, covering technology, adoption trends, use cases and key drivers. To learn how ORBCOMM’s industry-leading solution for remote container management reduces operating costs and cargo loss, visit www2.orbcomm.com/reeferconnect.